Jill Pollack is founder and director of StoryStudio Chicago, overseeing writing training for more than 1,200 students each year. She is a presenter on the power of stories in our personal and professional lives and was included for the fourth time in the biannual Newcity Lit Top 50 list of literary leaders in Chicago. Since founding the studio in 2003, Jill has focused her attention on developing new approaches to teaching storytelling, and providing a wide variety of experiences in writing and publishing for StoryStudio writers. In 2009 she created the Words for Work business writing program and is now the Co-Founder of Story Mode. 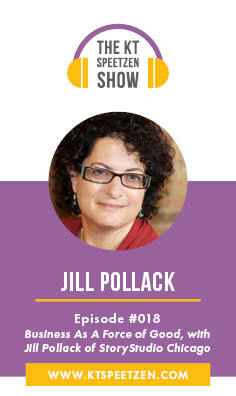 Today Jill stops by to discuss how Chicago’s literary community has changed since the origins of StoryStudio Chicago, how to build a dynamic internal culture, and why business should be a force for good. Jill’s ventures can be found at storystudiochicago.com and instorymode.com.